The original version of the Roman route tables was prepared two thousand years ago under the direction of Marcus Agrippa, the statesman, general and son-in-law of Augustus, the first Roman Emperor. Placed on the Unesco World Heritage List in 2007, the tabula is kept in the collection of the Austrian National Library in Vienna but cannot be viewed by the public. René Voorburg, a Dutch historian, has used recent research, including by British academics, to bring the tabula back to life on a website, omnesviae.org. 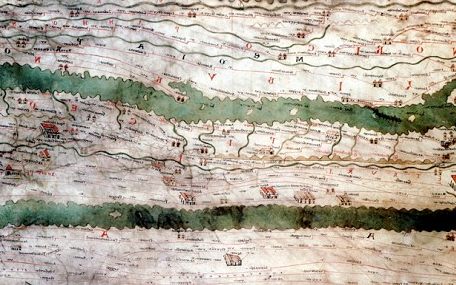 "Scientists have recently mapped all locations mentioned on the Tabula Peutingeriana," he said. "So I went and took a look which towns I would pass on a trip from A to B in the Roman Empire." According to the planner, a journey to Rome from ancient Britain, perhaps via the Kent port of Dubra or Dover, would take 56 days to cover 828 miles of Roman roads from Gesogiaco qvod nvnc Bononia (Boulogne) to the capital at the heart of the Roman Empire.